When your whole being is craving a big serving of sunshine, with warm sand and surf on the side, the Sunshine Coast is always a good idea. From July to October, Air New Zealand flies non-stop from Auckland to Maroochydore airport on the Sunshine Coast. At all other times, Brisbane is your launch point. The drive from Brisbane airport to Sunshine Coast is easy (80 minutes to Caloundra; two hours to Noosa Heads) or you can catch a shuttle. We talked to a bunch of locals to gather a collection of never-fail Sunshine Coast things to do and see. Some you might have heard of before; others are nuggets of local knowledge that will make your holiday extra special. 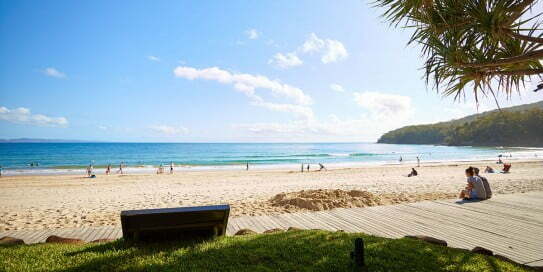 There's nothing nicer than a beach in Noosa, and they come in all shapes and sizes. 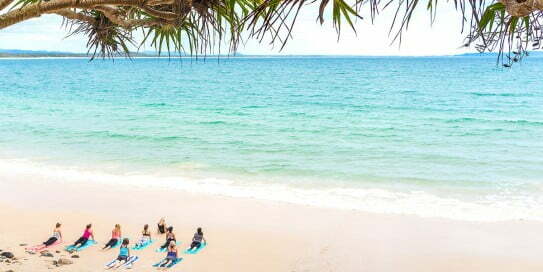 Noosa Main Beach is great for families, Noosa Groyne is the ideal spot for surfing practice and Noosa National Park has a selection of beautiful coves for peace and quiet. For a special treat stretch out in the fresh ocean air on your yoga mat - either amongst the trees, on the sand, or even on a stand-up paddle board. Beautiful waterfalls are the Sunshine Coast's best-kept secret. From the rural town of Maleny you can discover family-friendly Gardners Falls, which has a large pool perfect for swimming. Inland from Mooloolaba is Serenity Falls in Buderim Forest Park, another gorgeous spot for freshwater swimming in the wild. And in Kondalilla National Park near Montville, marvel at the scenic views over Kondalilla Falls after a refreshing rainforest hike. 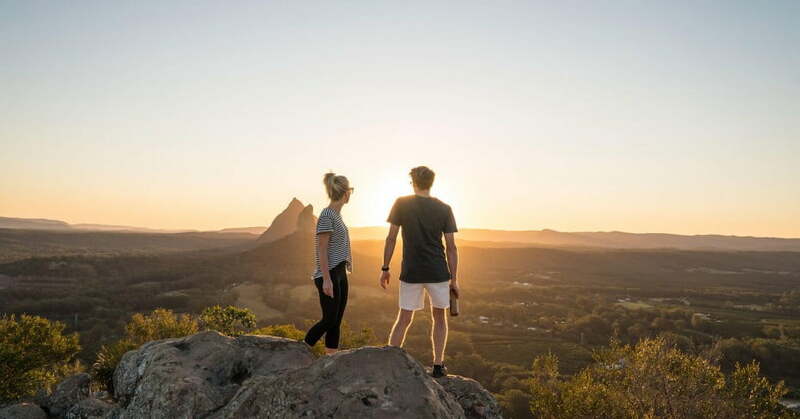 Head for the hinterland to discover the Glass House Mountains, spectacular volcanic landforms with equally fantastic names - Tibrogargan, Ngungun, Beerburrum, Beerwah, and Tibberoowuccum, just to mention a few. You'll get a cracker view of the landscape from Maleny, a friendly little heritage town with great cafés, a thriving art scene and the Sunshine Coast's famous Brouhaha Brewery. Separating Bribie Island from the main land is a wondrous stretch of water called the Pumicestone Passage. It's sheltered and full of wildlife, so just perfect for exploration by paddleboard, kayak or canoe. The ultimate encounter here is meeting a dugong (manatee). These gentle, seagrass-grazing animals are up to three metres long and weigh as much as 450kg. 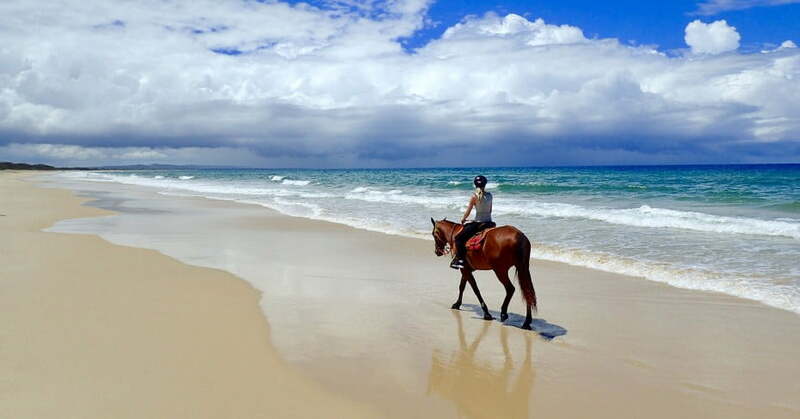 Horse riding along Rainbow Beach is one of those mind-blowing life experiences that will be with you forever. It's all happening - awesome scenery, wind in your hair and the back-to-nature freedom of horseback riding. Even if you've never ridden a horse before, this is one of the most fun things to do on the Sunshine Coast. Choose from a range of routes, including beach, country and full moon night rides. Wind and weather can do amazing things with sand, as you'll see at the Carlo Sand Blow - a moonscape of sand shapes at Rainbow Beach. From here you get spectacular views of towering coloured sand cliffs, Double Island Lighthouse and Inskip Peninsula. Any time's good for a visit, but at sunrise and sunset the landscape is especially impressive. Open every Saturday and Wednesday, the market at Eumundi buzzes with creativity, energy and friendliness. It's one of the most popular places to go on the Sunshine Coast, so arrive early to make the most of the craft shopping, wellness products, yummy food and unique services, such as a relaxing shoulder massage or having a tarot card reading. One of the best times to visit the Sunshine Coast is winter. You can count on sunny weather and you won't need a wetsuit for swimming. What's more, winter is the season for spotting humpback whale families as they enjoy a holiday in the warm waters of Queensland. Mooloolaba's a particularly good place for whale watching because there are local companies who'll take you offshore for a closer look and you even have the opportunity to swim with these captivating creatures. Every Noosa holiday deserves a river trip, so look for M.V. Catalina, a twin-hulled vessel that hosts floating events every week. You can buy tickets to Friday Night Social, Saturday Lunch on the water and Saltwater Sundays. The food is a highlight, along with just the right kind of music to suit the mood. When you're planning a trip to the Sunshine Coast, consider hiring a 4WD. It means you'll be ready to explore the Great Beach Drive, an off-road beach experience from Noosa's north shore all the way to Rainbow Beach. 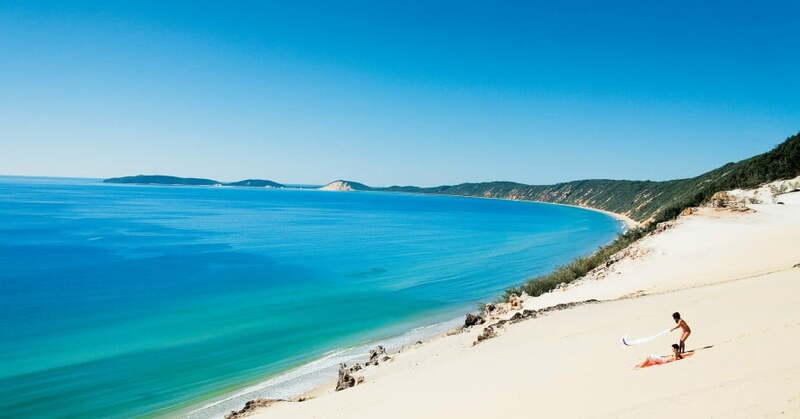 The perfect add-on to this adventure is the World Heritage-listed Fraser Island. A vehicular ferry runs from Inskip Point at the northern end of Rainbow Beach.